The first census since 2001 took place in Greece from May 10 to May 24, 2011; but the census team encountered a range of difficulties and many neighborhoods were reportedly not covered. The ministry did not extend the deadline. Results were published by ELSTAT in Greek and English in “Living Conditions in Greece” on September 6, 2013. Eurostat says the population of Greece is 11,329,600 as of January 1, 2011. The census, however, logged 10,787,690 permanent residents living in Greece, of which 5,303,690 (49.2 percent) are male and 5,484,000 (50.8 percent) are female. It confirms that the population is aging and shrinking. Enumerators or census takers hired for this period number between 50,000 to 68,000, depending on the news agency doing the reporting, and the official figure quoted by the Hellenic Statistics Agency (ELSTAT) on May 25 was 52,000.Several thousand quit before the census began due to confusion over whether they would lose unemployment benefits for taking a two-week assignment — first they said yes, then they said no — replacements were hired in haste, and more resigned after it started, citing difficulties in covering the designated territory and finding residents at home. Odds in finding people at home could have been greatly increased by conducting the census between March 30 to April 13 as originally scheduled, not in mid May when people are out enjoying Spring weather. And with racist attacks, increased crime, language barriers and assaults on/by police, it’s no surprise the elderly, women at home alone and foreign-born residents are afraid to answer the door. You can verify the identity of the person at the door by asking to see their Apografi ID and folder of red questionnaires and/or call ELSTAT at +30 (213) 135 2138 to get confirmation. No one should ask for your passport, ID, credit card, signature or Greek residence/work permit. All that matters is you participate and answer truthfully. Interpreters are supposed to be available, but migrant organizations say they were not taken up on their offer to assist, questionnaires are only in Greek, and there is no dedicated help line for non-Greek speakers. Disseminate accurate statistics on Greece and its residents. Initial stats are due to be released in June, but Greece has until March 31, 2014 to published all compiled data. By this time the entire social and economic landscape will have changed with continued austerity, recession and exodus of Greek, EU and non-EU citizens seeking work elsewhere. If you were not visited by an enumerator or census taker, ELSTAT opened its 94 local offices between May 25-27 to residents interested in filling out a questionnaire. (Option now closed). *I do not have time to translate them to English. But you can use an online translator or ask a Greek speaker to help. Have questions? Call the office local to you or (213) 135-2138, (213)135-2139 or (213) 135 2140. If you cannot read Greek, the paper says: How dare you go out on a nice sunny day to enjoy your life, do errands or exercise when we dropped by unannounced to ask you questions that invade your privacy. OK, it doesn’t say that exactly but close enough. News articles and the apografi website said a card would be left if no one was home, after which we could telephone for an appointment. In reality it was a photocopied slip of paper giving the date/time the enumerator stopped by and the date he/she would come back, at which time one of us better be home or there would be hell to pay under law 3832/2010 (underlined portion at the bottom). *Note that vital elements have been Photoshopped to protect privacy and prevent forgery. One of us wagered badly and got stuck staying home. Late afternoon, a young man with a badge and a dour looking young woman without a badge, presumably his girlfriend, came to sit at the kitchen table and collect our details. He was personable and asked questions from a six-sided questionnaire. She didn’t crack a smile and looked bored and annoyed. How many rooms excluding the kitchen and bathroom? What month/year did you move to this location? Do you rent/own or was it given to you by your family? Do you have a car? How many? Do you have a parking space? How many? Where is it/are they? The questionnaire also asked about swimming pools, year the building was built, solar water heaters, natural gas/electric heating, double-glazed windows, recycling, etc. However, the enumerator previously interviewed our neighbors and already knew many of the answers, some answers were obvious (i.e., our AC was in the same room) and some questions didn’t apply because we live in an apartment, so we were not asked everything. — If in Greece, where exactly. Athens, where exactly. — If outside Greece, only the country, not asked for the city. — If Greek, have you lived in other countries besides Greece? Why did you leave and/or come back to Greece? — Public or private school? — *Questionnaire did not allow for dual citizenship, with the enumerator checking ‘Greek’ then ‘Other’ and writing in the other nationality. — What level of education did you complete? — If you went to university, which one? Where is it located? — What subject did you study? — What type of business? — How many colleagues/co-workers do you have? — How many hours do you work per week? (Paid/unpaid) *Some people were told to only give the “official” number of hours (i.e., 20, 40) regardless of actual hours (i.e., 35, 60). Second jobs are not counted, and working for an employer outside Greece is categorized as not working in Greece, aka ‘unemployed,’ which (in my opinion) is somewhat inaccurate. Accuracy of data being collected is also a contentious issue, and some variation could have been avoided if online surveys were used instead. It’s supposed to take 20-25 minutes, but ours only took 10 minutes. According to news articles, we were supposed to be given information about organ donation, but we had to ask. It was not automatically offered. Every member of the family (including babies) gets a receipt that they participated even if they’re not physically at home, and a warning at the bottom advises you to keep it for your protection for up to six months. It is said that we should carry this receipt in case police ask to see it. Residents can be fined from 1,000 to 50,000 euros for not participating, and census takers from 10,000 to 200,000 euros for divulging confidential information. *Image had vital details Photoshopped to protect privacy and prevent forgery. If you wrote about your census experience in Greece, leave a comment and a link if you would like to be added to the list. Yeah, this was a whole lot of fun to try to fill out. The spaces for writing in “Other” answers were like trying to write on grains of rice. My favorite question on it was “for females of household over 10” and it was about how many “babies you have born not counting dead-born babies.” What a morose caveat! I’ve been waiting since day one but no one has visited my neighborhood yet (!) so I guess today is their last chance. I believe though that a census conducted via mail -at least in the cities and towns- would be more effective. Thanks for the mention of It’s All Greek to Me. Sorry that my article didn’t have anything to contribute. Love your article. hi! we didn’t get census as well. we are waiting for them, but no one comes to our place 🙁 and is it true that we have to pay 1000 euros? (for those who didn’t got the chance for census) thanks! If you were not counted, see the new section called, “Where and when to fill out a census questionnaire.” All best. Hey Kat what’s your opinion on the greek protests? I appreciate your question, but I only write commentaries for news agencies. All best. Someone came around to collect the info for the census, a young guy, but as I was just about to go out, he said he’d return the next day after 18:00 – but never did! Because under law 3832/2010, which I mention in the post, we are obligated to participate in the Greek census and therefore we broke the law and are subject to fines (also mentioned) if we didn’t. I can’t see police checking our papers, as they have better things to do. But this is GR, and you never know. A pity they didn’t ask about what languages are spoken at home (as e.g. the US long form does), or other sociological data. Guess we still won’t know officially how many people (still) speak Vlach, Arvanitika, Makedonski, Pontic, Turkish, etc, to say nothing of languages that aren’t indigenous to the territory of Greece. Hi Jason, nice to see you here again. That’s a good point. We were also not asked what other languages we speak, even though it is widely known that the majority of Greeks learn a second language. 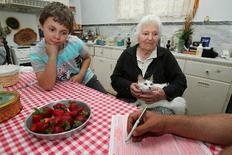 It’s possible the census will evolve with time. ημουνα απογραφεας και ηθελα να ρωτυσω γιατι ουτε οι ιδιοι δεν ξερανε να μου πουμε μηπως ξερετε ποτε θα πληρωθουμε?? ?εαν βεβαια τα παρουμε και ολασ αλλα ετσι συζητηση να γινεται!!! 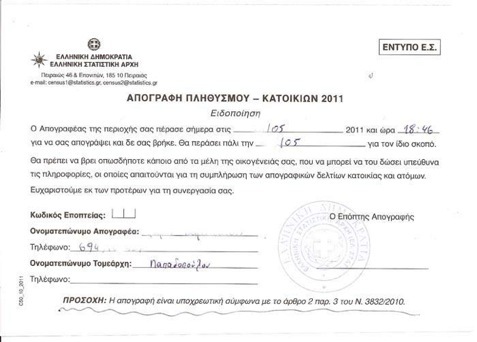 I’m just curious as to where you can check out the status of one’s greek citizenship? Thank you in advance!